BSA compliance is clearly something all financial institutions need to take seriously. The challenge is that high transaction volumes from online and mobile banking services give criminals considerable cover for money laundering schemes. Identifying a suspicious transaction is like finding a needle in a haystack. 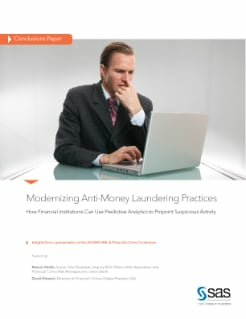 This paper presents insights from a presentation at the ACAMS AML & Financial Crime Conference on how to modernize anti-money laundering (AML) practices using sophisticated analytics capabilities which can significantly improve the effectiveness of suspicious activity monitoring efforts.